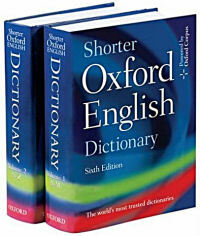 The five-yearly update of The Shorter Oxford English Dictionary (SOED) came out last week. One matter has caused a lot of comment — the decision by its editors to omit the hyphen from some 16,000 words in the work. A hyphen is a short dash specifically used to connect two words or to join syllables of a word that have been separated by the end of a line in printing. Its name is from the Greek huphen, together, though the Greek hyphen was a half circle under the words to link them. The use of hyphens to fill out or justify lines of text of fixed length goes back to Gutenberg. The hyphen is not the same as the dash — in typography, a dash is a form of parenthesis; it was once also used to mark the omission of words or letters, perhaps because they were considered rude. Compound nouns have traditionally begun as separate or hyphenated words but with a strong tendency over time to collapse into single words. A century ago, it was standard practice to write to-day, but the hyphen has long since evaporated from the page; similarly with teenager (teen-ager from its first use in 1941 until the later 1950s) and lipstick (it was two words in the 1880s, but became hyphenated around the 1920s). Americans have long been much more willing to write words such as postmodern without the hyphens that British standards require. It will be no surprise to learn that the SOED writes email, not e-mail, and website rather than Web site, since neither is new — they were so listed in the 11th edition of the Concise Oxford in 2004 (I’m old-fashioned in preferring the separated forms). The new SOED lists many hyphenless words such as leapfrog, bumblebee, crybaby, pigeonhole, lowlife, and upmarket, which will be a relief to those of us who have been spelling them like that all along (and all except lowlife are written without hyphens in the 2004 Concise Oxford anyway). The SOED does retain hyphens for compound verbs such as court-martial. But what is more interesting is the number of words that — on the evidence of the big Oxford English Corpus and the Reading Programme of the Oxford English Dictionary — are bucking the conflationary trend and are returning to separate words without their dashing copulas. So the SOED writes the terms — among many others — as fig leaf, fire drill, ice cream, pot belly, test tube, and water bed. It’s notable that this extends to attributive forms, such as ice cream headache (I ache to change that to ice-cream headache), though the grammar books argue a hyphen is required here. In this situation, leaving the hyphen out can sometimes lead to misunderstanding (twenty odd people is not the same as twenty-odd people and man eating tiger is quite different from man-eating tiger) which is why its inclusion is urged. But most of the time the meaning is clear without it, so the trend towards omitting it isn’t causing many problems. There can be no doubt from the accumulated evidence that the hyphen is on its way out, though reports of its demise are premature. Last modified: 6 October 2007.